Penelope of NYX Round Lipstick. Back then I never had any idea of having lipstick in color of black. But right now as I fell deeper into make up world, I think I have to try a lipstick in black. 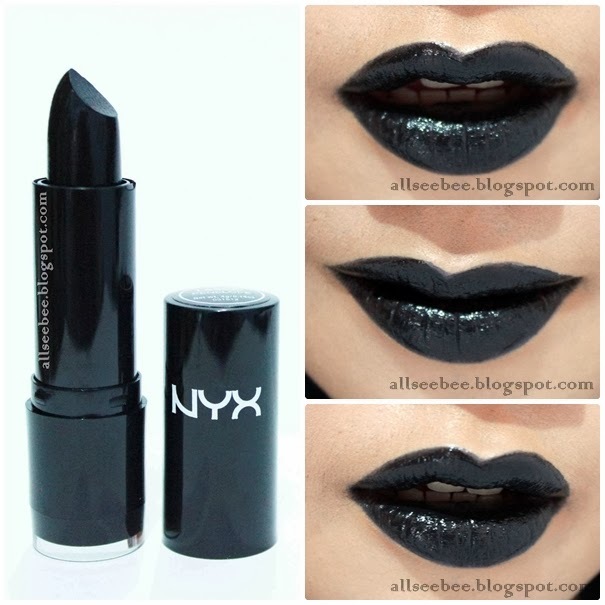 After I watched Michelle Phan's video about her Halloween Favorites, my desire to try black lipstick is even bigger. 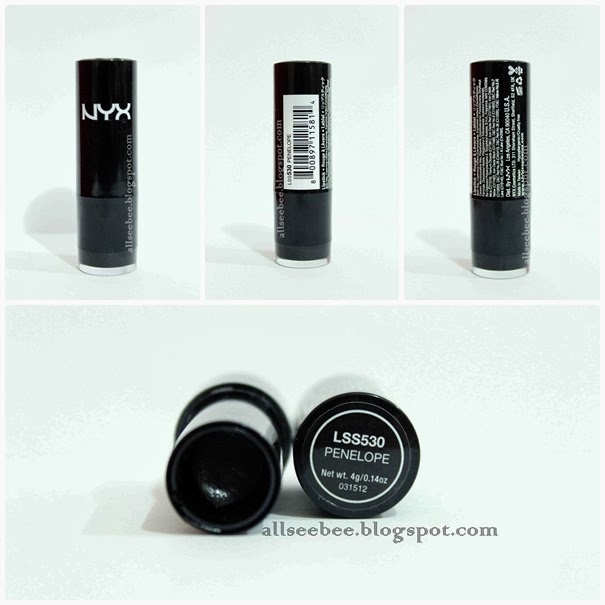 So, I was searching for any brands that had lipstick in black that (of course) affordable to me and ended up to NYX. I bought it from Chic Princessa. I was so glad that this Penelope baby is in stock which mean that I don't have to wait for weeks to purchase it. The first time I got this, I was a little bit surprised because of the new design. As you can see bellow, this lipstick is rather sheer. You need to apply more than two layers to really get the color. This lipstick is a true black without any undertone, just black. Oh yeah this lipstick is also very glossy. A little tips for you if you want to get the intensity like my lips in the photo above, you need to apply foundation or concealer on your lips before applying the lipstick. If you don't apply any foundation or concealer beforehand, it will look sheer and your inner lip part color will fade faster. Truthfully speaking, I love this kind of lipstick color even though I would not wearing black lip on my everyday life, but still a bold lip color like black is a brave statement. Do you want to try a black lipstick? Did you ever try one? Gessshh! Keren! Love that's color..
aaaa ini aku nyari kemana mana taunya ada di chic princessa :O kerennnn!